Stow Soccer Club is a non-profit organization located in Stow, Massachusetts. 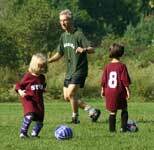 We offer fun and enriching soccer opportunities for children of all ages! Our main "goals" are sportsmanship and skills development. Sessions are offered in both fall and spring. Our Munchkins group is for children 4 1/2 to 5 years of age (preK). Children must be at least 4 1/2 to participate. Children should bring a water bottle and wear shin guards to each practice. Cleats are helpful but not required. Transitions AND Munchkins practices will be held on Saturday mornings, and the emphasis is on fun! Important Note: Parent (or other designated adult) supervision is required for all children participating in the Munchkin program. All children registered for the Munchkin program receive a ball and t-shirt during their first season of play. Our Transition group is for children in kindergarten. Transitions AND Munchkins practices will be held on Saturday mornings. Short small-sided scrimmages and ball-handling games introduce position play and teamwork concepts. Important Note: Parent (or other designated adult) supervision is required for all children participating in theTransition program. Children should bring a water bottle and wear shin guards to each practice. Cleats are helpful but not required. Children who have not played in the Munchkin group receive a ball and t-shirt during their first season of Transition play. Our grade 1/2 groups are for boys and girls in 1st and 2nd grade; players are split into boys' and girls groups. Kids this age are starting to learn about the game of soccer and developing their own skills. Sportsmanship and fair play are emphasized. The Stow Soccer Club follows a 4v4 game format (no goalie) as we believe that this format and philosophy will take youth development to a higher level. Most games are played on Sunday afternoons and there is one team practice during the week. Beginning with the (U10) age group, all teams are affiliated with the Nashoba Valley Youth Soccer League (NVYSL). U10 games are 6 v 6 and consist of 30 minute halves. All children at the U10 level and higher play on NVYSL traveling teams. There are typically 2 practices during the week. Girl's grade 3/4 teams play Saturdays at 9:00 AM. Boy's grade 3/4 teams play Saturdays at 10:15 AM. Home games for ages U10 and higher (NVYSL games) are played at Stow Community Park or Pine Bluffs. All players in the U12 and higher age groups are now a part of Nashoba United. Nashoba United is an extension of the Stow Soccer program, and combines players from Stow, Bolton, and Lancaster. NU is administered jointly by board members from each of the three towns. Nashoba United was created to give competitive players an opportunity to play in MTOC-Division 1. In the U12 age group, all teams are affiliated with the Nashoba Valley Youth Soccer League (NVYSL). U12 games are 8 v 8 and consist of 30 minute halves. All children at the U12 level play on NVYSL traveling teams. There are typically 2 practices during the week. Boy's grade 5/6 games are held on Saturdays at 1:00 PM. Girl's grade 5/6 games are held on Saturdays at 11:30 AM. Home games are played at Stow Community Park or Pine Bluffs. In the U14 age group, all teams are affiliated with the Nashoba Valley Youth Soccer League (NVYSL). U14 games are 11 v 11 and consist of 35 minute halves. All children at the U14 level play on NVYSL traveling teams. There are typically 2 practices during the week. Boy's grade 7/8 games are held at 4:00 PM on Saturdays. Girl's grade 7/8 games are held at 2:30 PM on Saturdays. This age group is the first to play 11 v 11 on a full sized field. Home games are played at Pine Bluffs. High school teams play 8 v 8 in an NVYSL recreational division in the Fall. Depending on team numbers, high school players may be combined or on separate teams. In the spring, each age group plays individually 11 v 11 in competitive and recreational divisions. These teams play on Sundays. Stow Soccer Club and Nashoba United are members of the Nashoba Valley Youth Soccer League (NVYSL), and are affiliated with the Massachusetts Youth Soccer Association (MYSA). Scholarship assistance is available for families in need; all requests are kept strictly confidential. For more information, please contact the treasurer.